4. Christ0-agapic (even Christofileic) (Aiming for the love of Christ, or brotherly love of Christ) – I am getting closer to the title I really like. The greatest commandment is to love God and love neighbour. If anyone does not love Christ, he is accursed (1Cor.16:22). Let’s make the love of Christ our saviour, our friend, our groom, our brother . . . let’s make that our goal. 5. Trinitari-koinonic – I think this is my favourite label describing the goal of preaching. Fellowship with the Trinity. What an honour! So as we preach the revelation of God’s heart in the Scriptures, let’s be sure to recognize how each text is revealing God, pointing to his values, recognizing his provision in both Christ and the Spirit, and delighting in his goal to bring us into the embrace of the Godhead by union with the Son through the Spirit. It is in union with Christ that we discover true life change, because it is only in union with Christ that we can know life itself. By our union with Christ we can share in the fellowship of the Trinity and thus see radical life transformation. Anything less, and looking anywhere else, will always disappoint. Any other suggestions welcome. 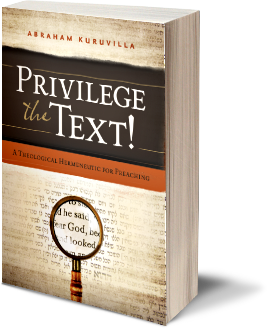 Preaching Christ in His Word is such a privilege, and Kuruvilla is right that we have to think carefully how we do that. thanks again for your posts (although this time I don’t really like the weird eccentric” titles ;-)). Would you be willing to elaborate on the subject of “our union with Christ” (that you mention several times)? I realize that it’s a very essential aspect of the Christian life and guess that you might have more to say on the subject (that is intertwined in the Trinity life). By the way, I really liked the book that you passed on at the CWC Conference last year, “The Good God” and I think it will be great if you can run again a workshop on a related subject (like “our union with Christ”?). Thanks Benoit. Perhaps I should go back and add translations of the labels. Union with Christ is a central doctrine of Christianity, but is often neglected in favour of an essentially legal understanding of salvation (i.e. we have a change of status). But union with Christ looks at the fact that in salvation we are united to Christ by the Spirit in a marital bond. When the Bible speaks of being baptised into Christ, or being “in Christ”, or “Christ lives in me,” etc. then it is speaking of something more than a mere judicial decision to change my status. So for example, in 1Cor6, Paul seems to have a very high view of what it means to be united with Christ. My sense is that a lot of Christian teaching is weak in this area and consequently our understanding of the Holy Spirit, of sanctification, of assurance, etc., all suffer. Thank you, Peter, for reviewing some of Abe’s material. We enjoyed an evening together discussing some of his approach last fall at The Evangelical Homiletics Society meetings. I appreciated your list of five more possible preaching goals. An important matter in all options is whether or not a preacher should preach Christ as the first step in reaching all the listed goals. For instance, Abe would say a preacher does not need to preach Christ-crucified in order to achieve his Christiconic goal. So part of the discussion is whether or not your five goals require stating the Gospel first. Thanks Randal, I can see that Dr Kuruvilla would not see the need to preach Christ-crucified to achieve the Christiconic goal. My suggested list of goals was not intended to be definitive, but rather a suggestion of different ways of framing the end goal that reflects the inherently relational nature of the gospel as the Scripture portrays it. I would agree that we should honour the text in respect to not forcing it to fit a pre-determined shape or theological assumption. Consequently I believe it is possible to preach a text without overtly making Christ-crucified the foundational step toward the goal. However, I believe we do need to preach the Scripture as self-revelation of a personal God who is inviting us to know Him through the ultimate revelation which is Christ-crucified. Thus I would be uncomfortable settling for a moral demand on the wills of listeners when the Bible seems to be consistently offering the revelation of a personal God who alone is able to transform the heart, life and moral character of a listener. The question is not really a homiletic one, but a foundational theological question that engages the key issues of who God is, what it means to be made in His image, what is the nature of sin, and how is that problem resolved. Your thoughts on the issue are helpful and appreciated. I do see this as a valid homiletical question. In my own preaching and in the preaching of my students, we wrestle with how to move from the Text to the application. Often the question is whether to preach Christ or, more often, how to preach Christ without sacrificing the integrity of the meaning of a preaching portion. Anyway, thanks for adding to the field of hermeneutics and homiletics.